The state summaries web site features a clickable US map for easy access to each state summary. 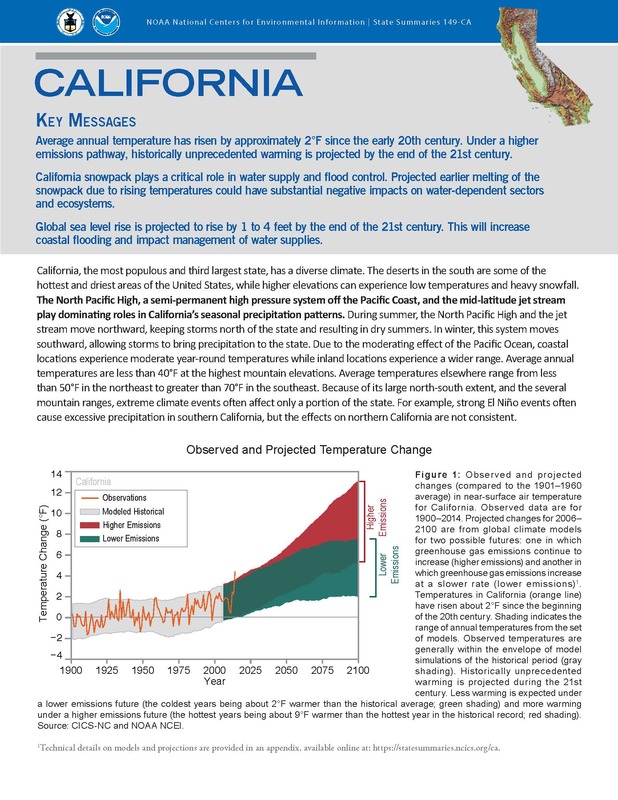 The front page of the California State Climate Summary PDF. In response to growing demands for state-level information on the assessment of climate change, NOAA’s National Centers for Environmental Information and CICS-NC have produced a set of climate summaries for all 50 U.S. states. These summaries, available via an interactive website and as downloadable PDFs, provide up-to-date information on observed and projected climate changes for each state. Focusing on characteristics of the physical climate and coastal issues in accordance with NOAA’s mission, these summaries are designed to supply decision makers, other stakeholders, and the public with highly relevant climate information delivered in an accessible and compact format. Each state summary includes three “Key Messages” highlighting important trends and projections, 7 to 10 figures presenting data on key climate variables, and narrative text providing details and context on observed trends, projected changes, and selected climate impacts relevant to that state. All states include figures showing observed and projected changes in annual temperature, annual precipitation, and the number of hot and cold days and nights and heavy precipitation days. Other figures are tailored to present information particularly relevant for each state, including drought trends for states in the Southwest, snowpack data for western states, and seasonal temperature and precipitation data—important for agricultural activities—for states in the Midwest and Great Plains. Supplemental PDFs provide more than 20 additional figures for each state, with information such as seasonal maximum and minimum average daily temperatures. References and supplemental documents with technical information on analyses and methodology are also available via the website and metadata for all figures will be available in the near future. 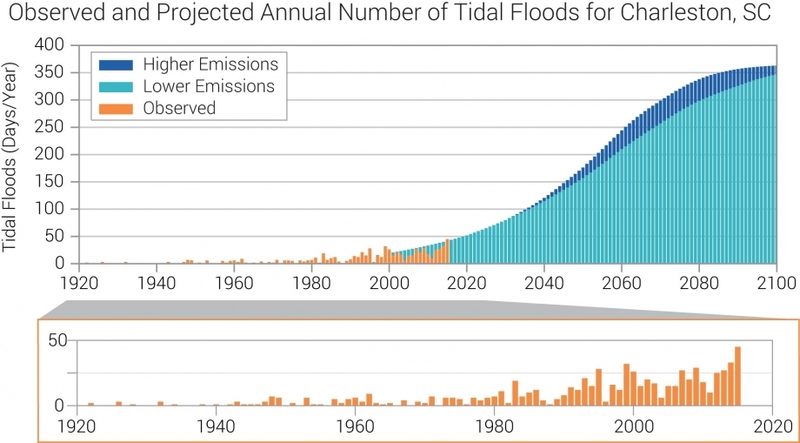 For many coastal states, the summaries include observed and projected changes in recurrent tidal flooding. In some locations, including Charleston, South Carolina, rising sea levels resulting from global warming and local land subsidence may make so-called “nuisance” flooding almost a daily occurrence by late in this century. The summaries were produced by NCEI and CICS-NC with additional input from other state and regional experts, including State Climatologists and staff from NOAA’s Regional Climate Centers. Each summary underwent a comprehensive and anonymous peer review process prior to release. An additional summary for Puerto Rico is currently under development. 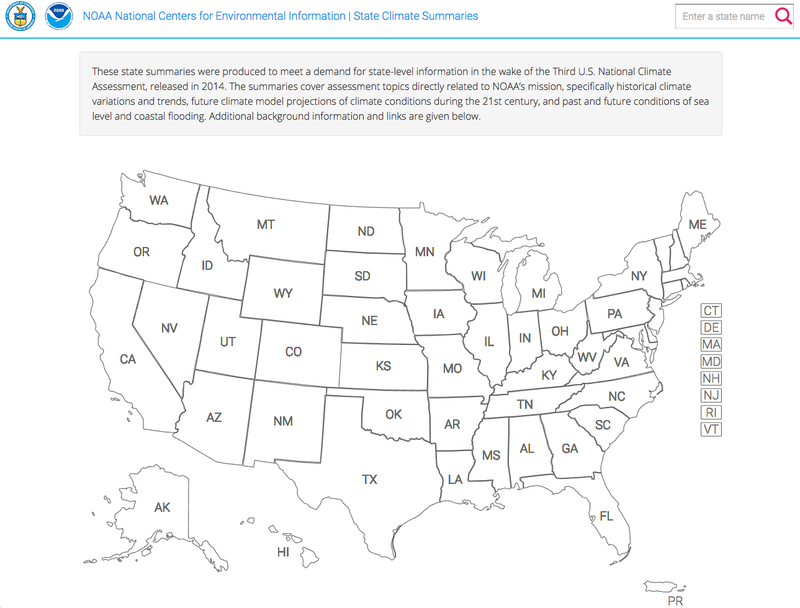 These state summaries build on research performed by NCEI and CICS-NC in support of the Third National Climate Assessment, released in May of 2014. They represent a key NOAA contribution to the U.S. Global Change Research Program’s sustained assessment process.